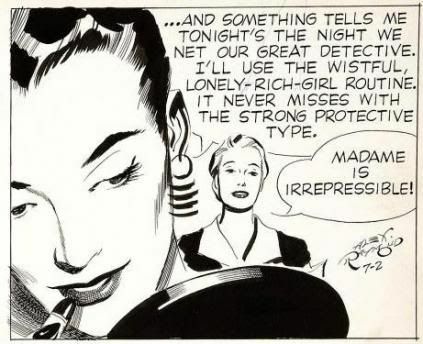 Everybody loves Alex Raymond, or at least I think they should! 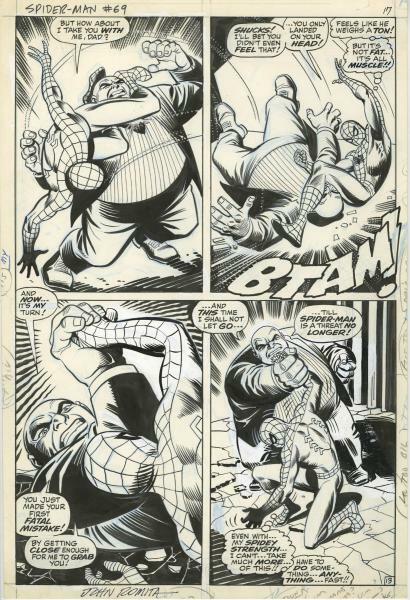 Who can doubt his impact on the comic art medium and American pop culture. George Lucas credits Flash Gordon as his inspiration for Star Wars; not to mention it kept actors like Larry "Buster" Crabbe and Johnny Weissmuller working for years. Raymond's millions of fans worldwide make him one of the most influential artists of our time. 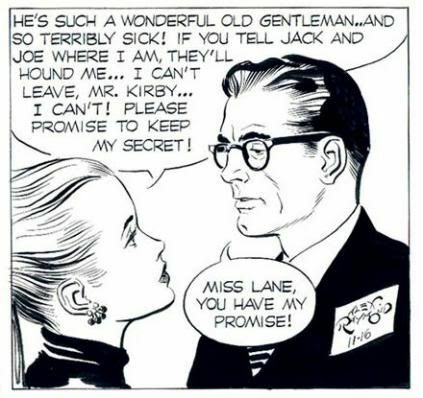 But I dare say his best creation was the "film noir" detective strip, Rip Kirby. 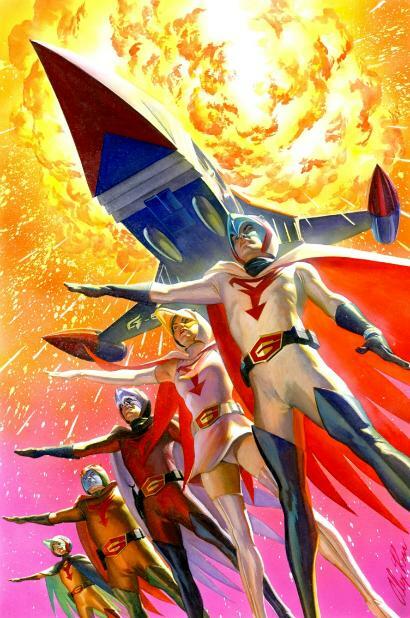 But, don't get me wrong, Flash Gordon, Jungle Jim, Secret Agent X-9 and the other projects Raymond produced during his career are undoubtedly some of the greatest comic works of the century. But for all of Raymond's skill and talent, I believe it reached its peak with Rip Kirby. Perhaps its also my favorite strip because I can still afford some examples! 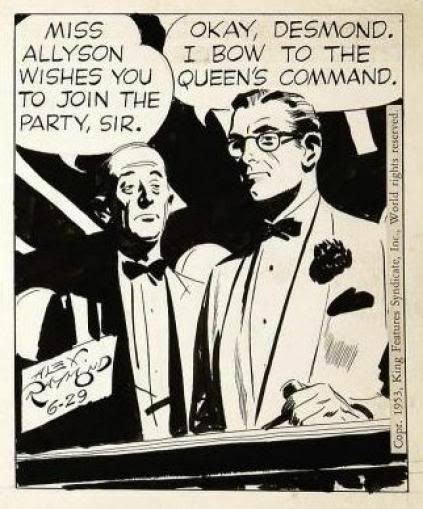 The story goes that when Raymond returned from WWII he was unable to resume Flash Gordon because of King Feature's contract with Austin Briggs. Not wanting to lose Raymond to a rival syndicate, they let him produce a new feature. It's debatable if King Features editor Ward Greene created the character, that was later more fully developed by writer Fred Dickenson. Whether Alex created the character or not, it was his success and name recognition that mattered with his audience. An instant hit for all involved, it even gave Raymond part ownership in the strip. And why not! Rip's not your average private eye. He's a perfect gentleman, who's also a brilliant scientist, athlete, Marine reservist, and sports car buff. Using more brains than brawn was his usual modus operandi in solving mysteries, but he still had time for a slug-out once in a while. It has many of the classic elements of detective fiction, but with a twist -- horn rimmed Buddy Holly glasses and a pipe! Similar in ways to other heroic gumshoes like Margery Allingham's Albert Campion and his side-kick Lugg. And to sweeten the deal, all the supporting cast are just as interesting as Remington, whether they're beauties, gangsters, hoods, con men, or cops. Who would't want the life of Rip Kirby? A Mr. Lucky that lives in a snazzy New York apartment with his trusted aide, the frail balding butler Desmond. A reformed thief who's as skillful in making a soufflé as using guns or picking a lock. Next, Rip is blessed to have a knockout fashion model for a girlfriend, Honey Dorian, who often travels with him around the world on his exotic cases. We also have some interesting heavies like the charming femme fatale Pagan Lee. She shows up in my favorite storylines to the dismay of Honey since there is this love-hate relationship Pagan has with Rip. The two girls make interesting copy since they are portrayed as total opposites. A dark seductive worldly Pagan "yin" played against a pure sweet heavenly Honey "yang." And who could forget Remington's greatest villains like the Mangler or gambler Fingers Moray. The strip debuted on March 4, 1946, and quickly introduced many new and innovative techniques to the medium. 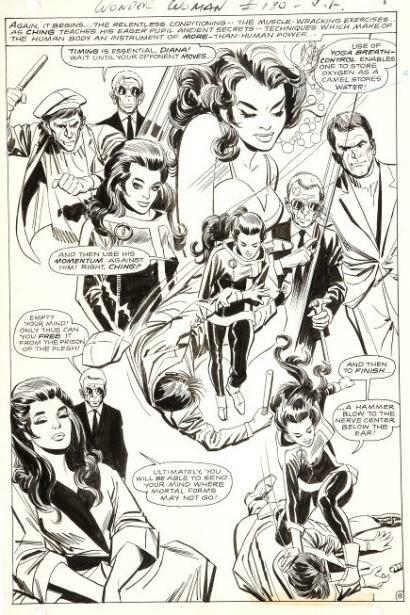 Raymond constantly searched for different ways to carry the story visually to readers with experimentation in his style. Driven for a clear and direct graphic, he changed the look every six or seven weeks on the daily. 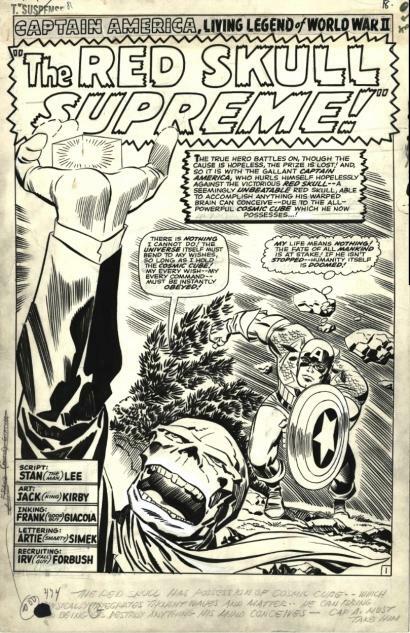 Always in firm control of his art and career, King Features offered Raymond $35,000 a year to produce a Sunday Rip Kirby page. Raymond declined citing the extra work the page would impose on his already limited free time. 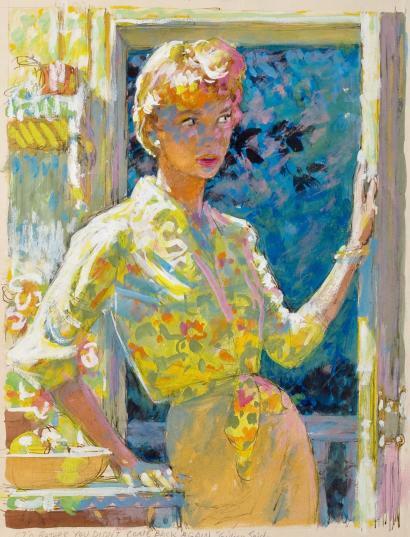 We know Raymond used models, took reference photographs, and swiped from magazines in his efforts to absorb different approaches. He worked close to deadlines, leaving only three weeks of strips at the time of his death from an auto accident. 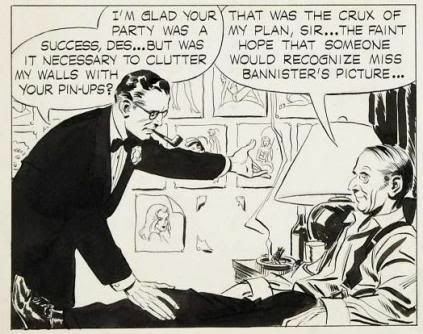 He was inspired by living and drawing in an illustrator's community with the likes of Stan Drake, Al Parker, Robert Fawcett, Albert Dorne, and others. It gave him fresh ideas on Rip that helped promote the realistic story strip with a fresh contemporary new look. Abandoning the old soap opera approach of a simpler outline style, Raymond brought numerous slick advertising techniques to the daily. Often he used a minute and detailed, close up, “big head” approach on Honey and the other beauties of the feature. 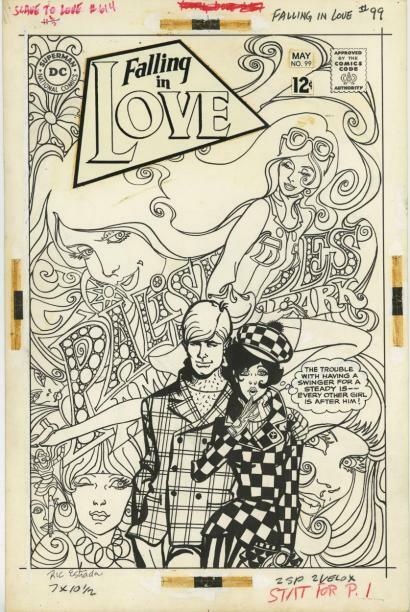 The strip can also be appreciated for its sophisticated use in "spotting" heavy black ink. Early Rip's seem sparse in the placement of blacks, being applied mainly for night scenes. But about three years into the daily, Raymond switched to using a heavy black even when in full sunlight. On one of Raymond's visits to Drake's studio he explained using black areas as “pools of quiet” for pacing. It served as a pause for the viewer, something to the slow the reader's eye across the strip's panels. Later in the run, Alex's simple backgrounds fully develop into a photo realistic approach to the surroundings as well. Also with Stan Drake's influence we see an expanding use of character expressions within the Rip Kirby cast. 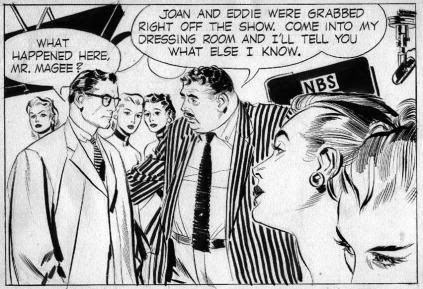 Perhaps Rip Kirby was such a success because Alex Raymond was a larger than like character himself that had many of the qualities of the famous detective. More sophisticated and urbane than the average artist, he was a striking figure: matinee-idol handsome, athletic, hugely talented and admired among his peers. 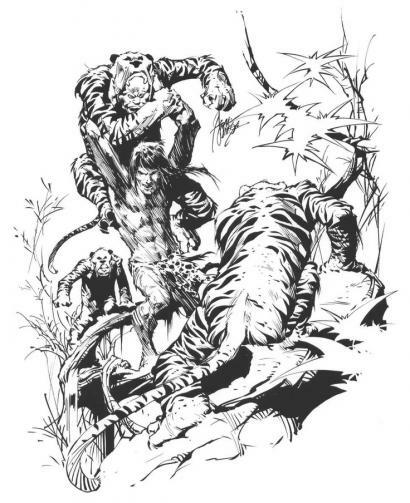 Raymond's art influenced many of the talented comic artists of today including Frank Frazetta, Al Williamson, Wayne Boring, Lou Fine and scores of others. 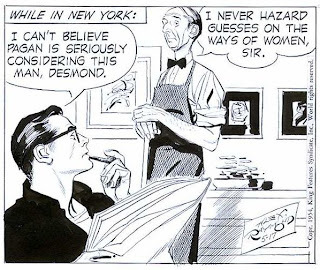 To mention a few of his achievements, Raymond won the coveted Ruben Award in 1949 for Rip Kirby, was a member of the Society of Illustrators, and served as president of the National Cartoonists Society for 1950 and 1951. 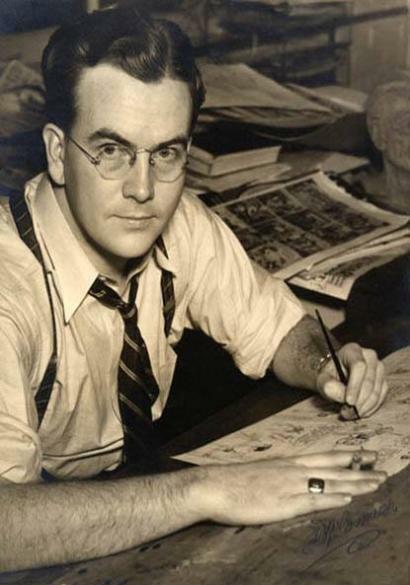 Even when producing both magazine and book illustration, and his combat paintings displayed in the National Gallery of Washington, DC, Raymond still always championed the comic strip as his preferred art form. He once said, "I decided honestly that comic art work is an art form in itself. It reflects the life and times more accurately and actually is more artistic than magazine illustration -- since it is entirely creative. 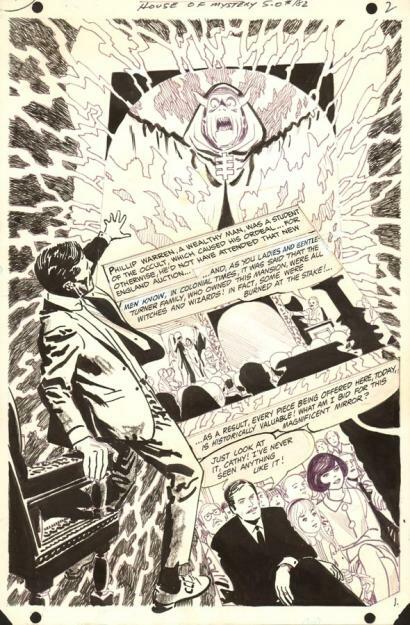 A comic artist is playwright, director, editor and artist at once." Oh, Those Seventies Art Prices!